How else to start this piece other than by saying that Olivier Giroud is currently the Premier League’s top assist-maker this season with four to his name? The four goals the Frenchman has bagged himself mean he has contributed to eight of Arsenal’s eighteen goals in the league this season in his eight games, while he’s scored one (very important) goal in two Champions League appearances. So that’s nine goals he has made or scored in ten appearances. Keeping up? The 27-year-old has become Arsene Wenger’s latest French bargain import, having unanimously impressed throughout pre-season and now when it really matters, after a first season which failed to win over everyone (despite notching 17 goals in all competitions). But it’s the improvement in Giroud’s all-round game which has been most significant, since we have established that he’s more than capable of scoring goals. Playing in a lone-striker system that was built around Robin van Persie over the last few years, the former Montpellier hit-man has taken time to get used to Wenger’s tactics but now looks comfortable dropping deep as part of what is increasingly becoming a ‘utility role’ in the side. 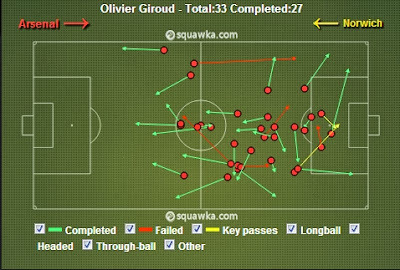 Giroud contested three of his four aerial duels in the middle third of the pitch, and his passing map shows his impressive link-up play around the halfway line and in the channels as he constantly gave his markers the slip with his excellent movement. The Frenchman’s new-found versatility was summed up with his inch-perfect cross for Mesut Özil to head home Arsenal’s second goal*. Of course I can’t not mention the delicate flick into Jack Wilshere’s path for Arsenal’s exquisite first goal; a piece of skill which is quickly becoming a trend for Giroud, who ironically is proving to have pretty good feet for a big man. Indeed it can’t be long before he earns the rather envious nickname of ‘one touch wonder’, with goals and assists galore coming from Giroud’s first touch upon receiving the ball. However, it must be noted that this isn’t a new piece of skill learnt in his back garden over summer, but rather something that was just as prevalent last season with notable examples being the chipped assist for Podolski against Montpellier, and the lay-off for Wilshere’s winner against Swansea. As Arsenal Column on twitter put it: “He's like that wall Bergkamp used to practice bouncing passes off - it comes back perfect”. Fortunately for Arsenal, Giroud looks like a confident wall and if his season continues in the same fashion as it has started, we could well be looking at a wall capable of scoring 20 league goals and being in the running for golden boot come May. Finally, Arsenal fans have something to cheer about and the Arsenal machine’s next victim is Dortmund, so bring on Tuesday.